Are you looking for information about kids' cooking and recipes? Many children love cooking, and recipes geared specifically towards youngsters make the task easier and more enjoyable for everyone. Kids like spending time in the kitchen at a surprisingly early age. Of course, parental supervision and involvement is always a necessity. Cooking games can make the experience even more fun and meaningful. Cooking is an excellent way to learn about nutritional value and healthy eating habits. While recipes that are fun for kids are often sweet, it's a good idea to learn about sugars and fats, and caloric intake for each day. Teaching children about nutrition while cooking is a good way to start a dialogue about healthy eating. Resist the urge to go overboard with this information for young children; while basic nutrition information is good to learn, obsessing about calories and fat can lead children to eating disorders in the teen years. Kids' recipes should provide clear, easy-to-follow instructions and use nutritious, simple ingredients. With appropriate recipes and supervision, kids can make everything from snacks to desserts. Cookies, cakes, cupcakes, and pies are good beginner recipes. For slightly more nutritious fare, have your children create salads, fruit and veggie platters, sandwiches, and smoothies. Older kids can also cook eggs, spaghetti, and chicken. You know your child's abilities and limitations. Make sure he has proper guidance and supervision at all times. When cooking with kids, remember to keep kitchen duties age appropriate. Toddlers and preschoolers, for example, should not be near the stove or oven, but they can stir and mix, set the table, and make sandwiches. 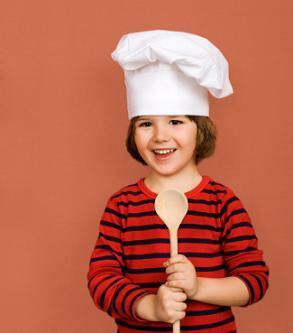 As children get older and more comfortable in the kitchen, they can handle increased responsibility, but they still need to be supervised, especially when using sharp utensils or heat. Use the opportunity to teach good hygiene too, washing hands before and after cooking, as well as any time potential contaminants are touched, such as chicken, eggs, or unwashed fruits and vegetables. On a rainy day or during a staycation, cooking is an excellent family activity. In the weeks leading up to holidays, cooking together and freezing some of the items can help you prepare for holiday meals while getting your kids excited about the holiday and involved in preparing for it.